It’s okay to admit you like brunch. Come on— gossip, day drinking, eating carbs? There are literally no cons to it. Maybe it’s your first time living in a place where brunch is a commonality. Maybe you’re a born-and-bred city girl who has railed against the concept of brunch and is finally giving in. No matter who you are, you’ve got to get brunch down right first to really begin loving it. That being said, here are a few basic rules to help you get started. Whenever I see people brunching, they’re either with their usual friends, or they have now assembled a Frankensteinian squad composed primarily of people from different, now-dead brunch groups. They are the Heathers of brunch; you kind of want to be them, even if they are giving you the side-eye while sipping mimosas because they’re all “pretty sure they saw you at Kyle’s party last weekend but now they can’t remember.” Nevertheless, here’s a handy Steve Irwin-esque field guide on how to identify and locate a bruncher in your area safely and responsibly. 1. The Deathly Hungover One: AKA the one we kind of all are. This person should probably be in the ER but they’re scarfing down chocolate croissants anyways. They will drink more than anyone else at the table combined, puke approximately 3-4 times, and then yell at birds as they leave the restaurant. Kind of like a millennial Hunter S. Thompson, I guess. 2.The Veganatrix: the annoyingly healthy one, AKA the one we wish we all were. They’ll side-eye you when they see you order a gargantuan mountain of French toast but will decide not to say anything because they “totally respect your decisions.” They are also, coincidentally, the one that leaves twenty minutes early to go do something they’d 100% rather be doing than brunch. 3. The Melodramatic One: AKA the one we always keep inviting, for some reason. They throw back peach bellinis as they talk about the latest catastrophe to hit their lives, whether it’s running into their ex at the bar the night before, or that one thing that happened like six months ago that you can’t remember but you nod along like you know what they’re talking about anyways. Unless your friends have convinced you to go to a Denny’s in the middle of nowhere, do not feel the need to order chocolate-chip pancakes. It’s okay. You’re free. Brunch is like Halloween: you get to be as extra as you want to and nobody can say anything about it. Get that weird, $15 frittata you know you’re going to regret ordering. Get a three-course meal the rest of your friends will get so, so mad at you for buying. Get the Oysters Rockefeller and then immediately ask for a gold-trimmed bib, and when the clearly-stoned waiter tells you they don’t have them, flip the table. Release yourself. As a tip, do not get the Eggs Benedict or anything else that will cause you to get queasy, since it’ll be mixed with all of the day drinking you’ll be doing. Also, don’t drink the orange juice, as it’s probably loaded with sugar (unless you’re in Williamsburg, because then there’s a 110% chance it’s been cold-pressed, or something else pretentious has been done to it to make it healthy). “B-b-b-but brunch is only supposed to be until 12:00, Savannah!” I knoooooooow. Relax. 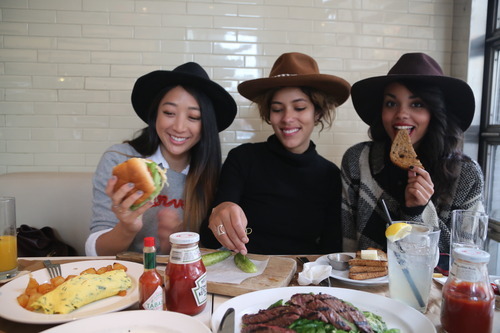 The cardinal rule of brunching states that most places close at— what?— three in the afternoon? The more you rush things, the less you’ll have time to enjoy them. It’s a dynamic equilibrium. Just order a vodka soda, kick back, and talk about why Lady Bird should have won an Oscar. If you take anything away from this, remember: take your damn time and enjoy your damn brunch.